Make an impact during Crohn's & Colitis Awareness Week. Share your #myIBD story and the challenges you face as a patient living with or a caregiver affected by Crohn's disease or ulcerative colitis. IBD affects everyone, regardless of age, gender, race, ethnicity, or sexual orientation. It can wreak havoc on your body, both in and out of the gut. It can also cause emotional turmoil, impacting one's body image and mental health. Despite all this, the IBD community is strong. 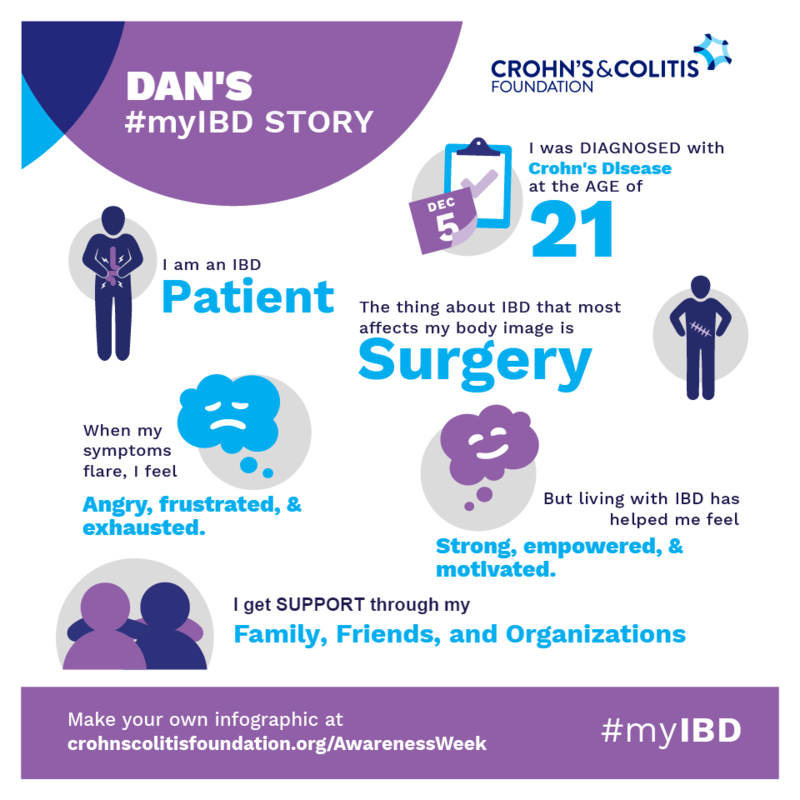 And Crohn's & Colitis Awareness Week is the perfect time to share your #myIBD story to show your resiliency while living with a chronic illness. Take any of the actions to the rightabove to share your experiences with the world to make #IBDvisible in 2018! Known collectively as inflammatory bowel diseases (IBD), Crohn's disease and ulcerative colitis are painful, medically incurable diseases that attack the digestive system, causing abdominal pain, persistent diarrhea, rectal bleeding, fever, and weight loss. Crohn’s & Colitis Awareness Week was created by U.S. Senate Resolution 199, "A resolution supporting the goals and ideals of Crohn's and Colitis Awareness Week, December 1-7." S. Res. 199 expresses appreciation to the family members and caregivers who support people in the United States living with Crohn's disease and ulcerative colitis. It also commends health care professionals who care for Crohn's disease and ulcerative colitis patients and biomedical researchers who work to advance research aimed at developing new treatments. Most of all, Crohn's & Colitis Awareness Week is designed to bring together the IBD community around a shared goal—to raise awareness and educate the public about IBD as part of our mission to see a future free of Crohn's and colitis. Sharing your #myIBD story during Crohn's & Colitis Awareness Week is easy! Take any of the actions below to give these invisible illnesses the visibility they need and deserve. You never know — you could educate others and even show someone a vital community exists if they need it. You are not alone! Add yourself to the Crohn's & Colitis Awareness Week map and let the IBD community know that you are proud to stand with them. Please fill out the Captcha below to prove you're a human. Help us understand the issues you face when accessing healthcare. Take our healthcare access survey and help inform our future advocacy priorities. It is estimated as many as 3 million Americans live with inflammatory bowel diseases. Learn more in our fact book. Living with IBD can be difficult, but the right resources and support can help make things easier. Join the Crohn’s & Colitis Community. Daily living with IBD can also affect a person’s mental health, and many experience sadness, depression, stress and anxiety. Donate to the Crohn’s & Colitis Foundation today and all gifts will be matched by a generous anonymous supporter up to a total of $600,000. Don’t wait—this special match offer expires at midnight PST December 31. Together, we can create a world free from IBD! Select from the list below the type of information you are most interested in. You can refresh the page to select another option. This information will be used for internal purposes only.